In 2015 two items will be in the news again and again, Russia and the price of oil. Each presents some fabulous opportunity as distortions created by fear create extra value. As the 2015 news unfolds, there are three factors about oil and Russia, plus many other countries, to keep in mind. 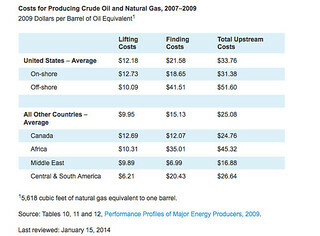 #1: The price of oil versus uplift cost in the various oil producing countries. #2: The price of oil. #3: The price of oil for oil producing countries to balance their budget. This is a really important point because oil extraction when oil is selling at 60 dollars a barrel can be profitable in many countries (such as Russia), but not create sufficient revenue in countries where the political process and government are financed by oil sales. For example Ecuador, OPEC’s smallest producer needs about an $80 dollar a barrel oil price to balance its fiscal 2015 budget. Ecuador has crude-oil reserves of 8.8 billion barrels and crude-oil production of a half million barrels a day which is a tiny 0.6% of total world production and 1.7% of OPEC’s production. Sustained low oil prices could put a lot of pressure on Ecuador’s government. Russia, as shown below produces oil at about $8 a barrel overall, but needs a crude price of $100 to balance the nation’s budget. Price of oil compared to production costs is less important than price of oil compared to budget deficits. Keep this in mind as plunging oil prices create contrasts and distortions that equate to value and opportunity. 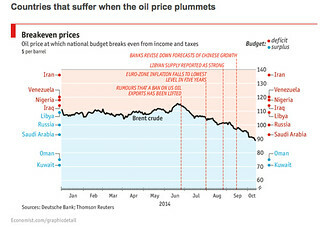 Chart from Economist “Black Gold Deficits” (1) Click on image to enlarge. Here are some definitions you’ll want to know in the year ahead. This will help all of us to understand the news. #1: Lifting costs are the costs of oil and gas wells and related equipment and facilities to bring oil and gas to the surface. #2: Finding costs are exploring for and developing reserves of oil and gas and the costs to buy or lease oil and gas reserves. #3: Upstream cost (also called Capex) and it is the total cost to produce crude oil and natural gas including lifting and finding costs. #4: A brownfield is an oil or gas field that has proven production. 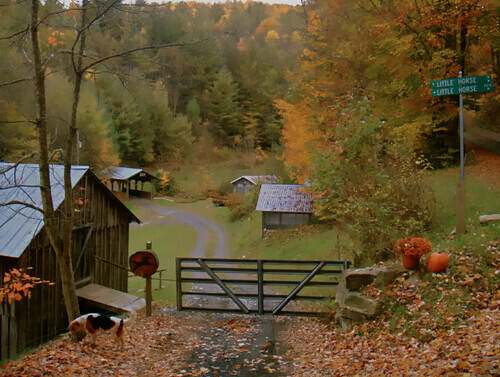 #5: A greenfield project is a completely undeveloped area of possible production. #6: BOE is Barrel of Oil Equivalent. We can see how opportunity will develop in an article “These countries are getting killed by cheap oil by Jesse Solomon” (2) Bolds are mine in all the excerpts below. Here is an excerpt: The price is not right for many oil rich nations. That’s bad news for Iran, Nigeria, Venezuela, Russia, and Saudi Arabia, among others. They need the black stuff to trade at far loftier levels in order to balance their budgets. Iran’s budget, for example, is built on oil at $135 dollars per barrel, according to data from Deutsche Bank and Thomson Reuters compiled by DoubleLine Capital. Russia has oil budgeted at $100, while Saudi Arabia will break even at $95 per barrel. OPEC’s idea is to try to knock out U.S. shale producers by driving prices lower than they can afford. That way Saudi Arabia, the cartel’s biggest exporter, can keep its market share in the U.S. But the damage to its fellow oil exporters could be severe. In Russia, for example, the ruble is plummeting. Iraq is already having trouble fighting ISIS, and lower oil prices won’t help. Libya is in chaos. Venezuela’s economy, already on life support, depends on oil for 95 percent of its export revenue. 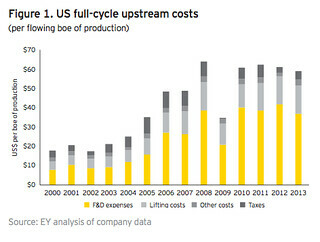 An Analysis by EY (Ernst Young) US upstream cost prices and the unconventional treadmill (4) say: As was reported in our US reserves studies, US upstream oil and gas spending has been increasing rapidly with the onset of the so-called “shale” or “unconventional revolution,” beginning in the middle of the last decade. We can also use the related reported data to estimate costs on a full-cycle basis, noting that notional full-cycle costs have surged (along with global oil prices) from an average of around US$20 per barrel of oil equivalent (boe) before 2004 to more than US$60 per BOE as of 2013. As shown in Figure 1, apart from the distortions related to the global financial collapse in 2009, notional full-cycle costs have averaged over US$60 per BOE since 2008. Chart of US costs from EY Analysis. The Bakken Magazine (5) says: The evolving Bakken story has just added a new, utterly complex twist. Crude prices—economically advantageous for the shale oil industry in the past five years—have fallen. Few, if any, can predict when the price bottom will be reached or what falling crude prices will mean to the Bakken shale play. And, although many have tried, few, if any, can offer an acceptable prediction on what falling crude prices will mean to the Bakken shale play. Russian oil and gas companies the production of oil in Russia remains cheaper. 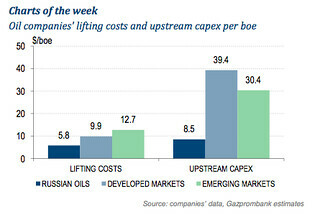 Thus, average lifting costs per BOE $5.8 /boe for Russian oil and gas companies over the past three years, while lifting costs averaged $9.9 BOE. The same is true for upstream capex per BOE. 2013 the average ratio for Russian oil companies stood at $ 7.6 /BOE, which is less than one quarter the level of Developed Market majors ($34.5/BOE) and less than one third the level of Emerging Market oil companies ($25.5/BOE). The reasons are much higher rates of onshore production at brownfields in the overall production structure. As the depletion of currently producing major fields continues in Russia lifting costs and upstream capex increases at approximately the same rates as globally. How to take advantage of the situation. One way is to cash in on fear. An example comes in a recommendation from Eric Roseman at ENR Asset Management. Here is an excerpt of a note that Eric sent me: Gary, This is a special bulletin that deserves your full attention. With crude oil prices crashing more than 40% since June, the entire energy-related infrastructure, including oil drilling, exploration and development, has been threatened. The entire energy space has plunged since November with the latest leg falling off a cliff this month as oil continues its relentless decline, now at $55/barrel this morning for West Texas crude and $59 for Brent oil — compounded by a financial crisis in Russia as the ruble tanks. Crude oil now trades at its lowest price since 2009. The market fears a sustained price war where OPEC, led by Saudi Arabia, refuses to cut production while American shale producers flood the market at the same time. This game of ‘chicken’ will end badly for the shale sector, if oil continues to slide. I think Saudi Arabia is trying to put the American shale companies out of business. Already, bond prices for shale companies – responsible for about 20% of all high-yield debt financing over the last four years – are suffering from big redemptions from investors as cash-flow continues to threaten operations for the most marginal producers. We now foresee a wave of defaults by the most leveraged U.S. shale companies with oil prices at these low levels. Although the bear market in oil is bad news for energy investors, it’s very bullish for refiners, or companies that refine and sell gasoline, diesel and other distillate fuels. One of the sector’s true mavens is Tom O’Malley, who has spent more than 30 years in the business specializing in taking troubled refiners and turning their economic fortunes around. He’s made millions for his investors. Today, Mr. O’Malley is the CEO of small-cap company, PBF Energy (NYSE-PBF). 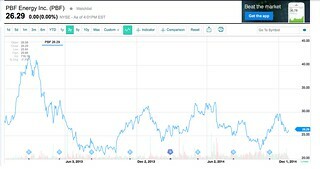 The company went public about three years ago and trades 35% below its all-time high and 20% off its 52-week high. The stock trades at just 6.3 times trailing earnings, 1.37 times book-value and yields 4.6% in annual dividends. This is a great value-and-growth story. With crude oil prices in the basement, growth investors should be accumulating a well-managed company like PBR Energy now. My advice is to buy PBF Energy at market at Jyske Bank and place a 20% stop-loss on your entry price. This is the best time since the financial crisis in 2008-2009 to buy refiners. Reaction to oil prices may reflect political rather than market concerns. These reactions may be illogical and as the Bakken Magazine article stated: Although many have tried, few, if any, can offer an acceptable prediction on what falling crude prices will mean. This creates fertile ground for distortions that create value opportunity. 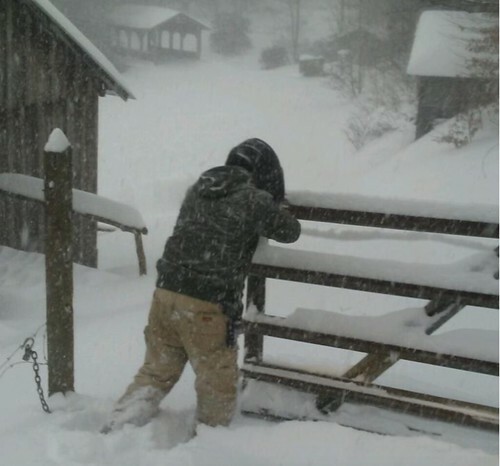 We’ll watch for these situations and share what we find.